Apple rocks at marketing—I think that's something fanboys and haters can both agree with. From building an incredible amount of buzz, to driving fans out to buy products, to keeping repeat customers for life, they really have their act together. There are a lot of things small businesses can learn from Apple's success, and most of them easily translate from the corporate world to the small business world. The strategies that set Apple apart from its competitors are strategies that you can learn to use too. If you're lucky, you might just grow a fan club the size of Apple's. Read more to see what Apple can teach you about marketing your business. It’s important to be pretty. In all of Apple’s product lines and marketing materials, you won’t find a single thing that isn’t pretty. From their product design, to their product packaging, to even their television ads—Apple spends a considerable amount of time making their stuff look better than the competition. As a small business owner, you probably should too. There are several opportunities for your small business to have great looking materials. Website design is one place to show off; brochure design is another. Perhaps the most useful would be to create really awesome business cards. Of course, if your company sells products you should probably make them look great too. A quick look at their website, and you’ll see that Apple fully believes in the old adage “a picture is worth a thousand words”. With the amount of information and content floating around these days, I’d say I agree with them. A good picture has more impact, it can be digested faster, and it can convey more feeling than a similar sized block of text. Images also just look prettier (see previous point). Finding great images for your business to use can take time, but there are several resources available to help you. My favorite sources for images are Flickr (make sure to check licensing info) and iStockPhoto. With those two massive photo collections, and a little bit of time and effort, you should easily be able to come up with some powerful imagery. 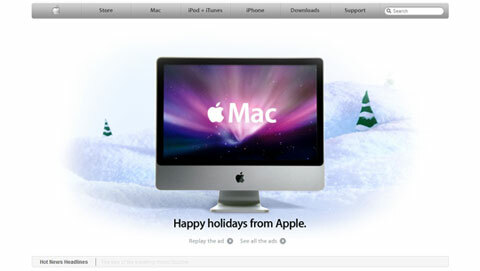 Apple’s been practicing what many authors and marketing gurus have been preaching: keep your marketing message simple. Simple messages are easier to understand, easier to remember, and easier to share. Stick to what’s important and keep your message free from extras. You’ll be following in Apple’s footsteps in no time (well, at least you’ll be better off). Let your fans do the selling. Look closely at any of Apple’s commercials, and you’ll notice something interesting. They all feature a customer or a user. Apple’s strategy isn’t to tell you how cool their stuff is (since you probably wouldn’t believe them anyhow), their strategy is to show other people using and talking about their products. It’s just more personal, and more believable, when your fans promote for you. One way to use this idea with your own business is to encourage your customers to rave about your product. The best way to do that usually involves exceeding their expectations and delivering a fantastic product. Let the media do the talking. Instead of the traditional advertising blitz in the months and weeks leading up to a product launch, Apple takes a more subtle and viral approach. They like to slowly leak details about a new product, then give a presentation to ‘wow’ reporters and media people, and finally they put out a simple press release. The end result of their careful lead up is that literally every mainstream news outlet (and thousands of smaller ones) starts talking about them. During this period, they don’t spend a dime on advertising for the new product. The media can be a very powerful force, especially for small businesses—if you can only get them talking. By Apple’s example, you can do that by giving them something new and unique to talk about. Create a unique customer experience. Every stage of customer interaction is carefully planned at Apple. The minute you visit their website it seems like you’ve entered a different web. If you visit one of their stores you feel like you’re at an exclusive party. When you finally buy their product, even the packaging makes you a part of Club Apple. The consistency and uniqueness of Apple’s customer experience is one of the biggest achievements of their marketing department. Once you become a part of their fan club, it’s hard to turn back. Creating your own unique experience is as simple (or as difficult) as deciding on what makes your company special and showing that consistently through all of your customer touch-points. As challenging as it may be, creating a consistent and unique customer experience is one of the most rewarding things you can do for your small business. If a company’s head is in the right place, chances are its feet will be too. At least, that’s how a lot of customers see it—and Apple has taken the idea to heart. Having Steve Jobs present every new product Apple releases shows customers that upper-management cares. It also shows that the CEO is a smart, excited, and friendly person. Since he’s running the company, it’s only natural to think that the company will reflect his personality. This is one of the lessons from Apple that is even more important in small business. Your customers will judge the quality and character of your business more by its upper-management than by its underlings, which means you have to get out there to show just how charismatic you and your business can be (since I’m assuming you are upper-management). After Apple’s tremendous takeover in the mp3 player market (about 5 years ago), it would have been very easy for them to bask in their success and become complacent. But that isn’t what they did—they continued creating, releasing, and marketing new products. It’s a good thing too, because they’re competing with giants like SanDisk, Microsoft, Creative, Samsung, and many others. One of the best things you can do for your marketing efforts is to keep your product one step ahead of the crowd, that way there is no choice but to stand out. Apple has proven this fact time and again, with the latest break-away release being the iPhone. Did you know that LG, Samsung, HTC, and Nokia all have a big touchscreen phone, very similar to the iPhone? Most of them even have 3G, and most have more functionality than the iPhone too. What makes the iPhone special is that it was released with a beautiful design, a simple-yet-powerful message, lots of pretty pictures, and an unequaled customer experience—all provided by Apple’s well-oiled marketing machine. I don’t personally use many apple products (I’m a vista guy), but I wrote this article because Apple’s marketing machine really is superior to most other companies, and the things that make them great are all things that apply to small businesses too. Pay a little attention to what they do, and you might just get some great ideas for your own business. Design definitely has such a powerful impact. Not being much of a drinker (allergic to tanins), I struggled picking wine out for friends the other day. Guess which was the deciding factor - “Julie, lets buy this one , its pretty.” Peter & I laugh all the time about the fact the people are more willing to accept rediculous bugs in pretty apps (after all check out the newest ical - what a failure). Then there is the question of cool. In the US, unique and contrary always lead cool. As apple gets less unique and contrary - who will come in to fill that gap. Will apple soon stop being cool? Junaid: I’m glad you enjoyed it. Shane: I think they may have lost some of their newness, but I think it will be a while before they stop being cool. As much as their products may be similar to the others on the market, their positioning is so different and their user experience so unique that I doubt they will lose their fan club any time soon. I think their ascension from mediocrity was brought on by great marketing, and I think that their continued success still depends on it. I do agree that Apple has its products and marketing down—as someone who just switched to Mac (after starting off with C64, Atari ST, and then a slew of home-built PCs before a Dell laptop), I must say the experience has been more than pleasant. Yet you may have the slickest-oiled marketing machine, but you still gotta deliver the goods (iCal withstanding, I guess). For me, the switch to Intel was the final kicker. Anyway, a very insightful article. I notice your website follows similar principles—I shall have to check out the rest of it. nice, you list all the big points. Dave: I definitely agree about having to deliver. The best marketing you can possibly do is to give your customer a great product, and the opposite is also true too. Jacky: Sounds great, I’m interested to see your thoughts and opinions. Being a little cynical and having being accused of elitism by my friends, I have to say that you can put fantastic equipment in front of the public and they are proud to tell you what they own. But tell me what you can produce on a Mac that I can’t produce on a PC. Most of the people I know with Mac have them as a trophy. Nothing wrong with that but they have to learn how to create and stop using words like ultimate, awesome, unique, experience and my god! In other words get the equipment, ( and I agree totally with the author) but learn how to create things that meet objectives. I have a Dell laptop. It’s sleek, silver and has white edges. My daughter had just bought an iPod, which came with two stickers - big white Apples straight from MacIntosh. I stuck one on my laptop. Man, it’s too funny. “You have an Apple?” Strangers stop to watch me work. “Oh.” All interest gone and the person walks off. Haha, that’s hilarious. Did you know that dell actually hired an ex-Apple product designer to make those laptops, the white bordered ones? That just goes to show you how much strength is in the Apple brand, and that even great product design isn’t everything. The best part is I get to feel smug and cool with an ultra cheap beater computer. Until I have to admit I don’t have a Mac. Yet. Great article! The beauty and artistry of Apple - and even moreso the dedicated Mac fanatics I know have convinced me to make the switch. I just got my first Mac laptop last week and I absolutely love it. Being an audio engineer, I can tell you that there most definitely are things you can do with a Mac that you can’t do on a Windows PC. I’ve had my Macbook Pro for several months yet, and not one application has frozen, not even once. I have not even had to restart my computer at all, I just put it to sleep when I’m not using it. On the contrary, when I tried to use my Dell desktop with Windows XP a few days ago, it froze multiple time, shot out countless errors and just plain didn’t work right. Maybe as my Mac gets older it will start to show signs of age by freezing more often, but I doubt any operating system could cause more headaches for someone doing processor-intensive editing than Windows. Here there are people (a lot of them) waiting for the official release of the Apple iPhone. The BRAND is considered a pride to own. You have an Apple in your hand, and you become a Magnet in that place.Its Marketing at its very best. I have been a fan of Apple and ll continue to be. A nice article there. Keeping it Simple always works..
Aside from the NFL, Apple may have the best, most effective, marketing in the history of modern communications. Nice article. why not learn from the best? Excellent “lessons to be learned” take on marketing and I like the simplification. I sent the link to my wife who unwittingly has pretty much been following these basic guidelines ever since she co-founded Delaware Hypnosis Partners 5 years ago. As her creative consultant, I urged her to re-read your article at least weekly to maintain her focus as you’ve managed to condense on one page the essential tools of business atttraction. Nice blog overall, by the way! “A thousand songs in your pocket” Checkmate! Big Pics are the most over looked and easiest thing to fix! Nice article. Apple really does an amazing job marketing. Their Mac vs PC campaign has really made Apple products “cool�? and PCs “boring�?. They play off all the things you hate about your PC computer and their simple, straight forward message really sinks in. Very nice tips. And its true being simple but deep creates universal messages. These messages can become intruiging but yet interesting and promising. Being unique also does great marketing movement. Everyone wants to become different, so a company to effectively do marketing - must make a difference. One of “The Best” articles I have ever read and very helpful. Short and to the point without alot of wasted fluff. Wish more writers would stop wasting our time and get to the point like this article did. Interesting article; Apple has always been at the top of it’s game when it comes to advertising and promotion. 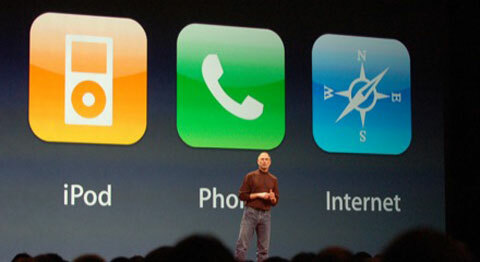 All of these tips have really helped Apple to increase their brand awareness and momentum over the years. A picture is always worth a thousand words. Nobody reads block text because 1) they don’t have time and 2) they simply don’t want to. We used to rely on block text for our website(s) until we realized people were not responding to it. I can please see the Web site had been very much appreciated. I am grateful to read this excellent, purpose! I have been investigating a new product to experience a little search for you all no doubt, to be published. Loved reading this article. Steve Jobs certainly was a genius. Apple certainly knew how to market. They took regular off the shelf technology and turned it into a movement. Apple truly rocks. What a waste Steve Jobs is gone. Belgravia——I am curious as to why you think “they’” rock. You’re so cool! I don’t suppose I’ve read anything in this way before. So nice to uncover somebody with some original ideas on this subject. really thank you for beginning this up. this fabulous website are some things that is required on the internet, a person with a bit of originality. helpful task for bringing a new challenge for the net! You’re so cool! I don’t suppose I’ve read anything in this way before. So nice to uncover somebody with some original ideas on this subject. really thank you for beginning this up. This is a great inspiring article about Tao of Jobs in USA. I am pretty much pleased with your good work. You put really very helpful information. Keep it up. Keep blogging. I’m look to reading your next post. Good data, thank you to McDougal. It’s incomprehensible if you ask me now, in general, the meaning and performance is frustrating. Thanks again for nice information about Tao of Jobs in USA and best of luck. You’re so cool! I don’t think I’ve read anything like this before. Thanks for your personal marvelous posting about Tao of Web Hosting! A fantastic webpage about Hostgator Coupon Codes always comes-up with new and exciting information and while analyzing I have think this webpage is really have all those fantastic that are qualified a webpage to be a fantastic one. I was able to find the details that I was searching for. I must thank you for the initiatives you have made in writing Hostgator Coupon Codes article. All the contents you mentioned in Hostgator Coupon Codes post are too good and can be very useful. I will keep it in mind, thanks for sharing the information keep updating, looking forward for more posts. That’s great! Thank you for post about Hostgator! Awesome! And one more thing: If you will have some free time, you can find many goods for yourself here - That’s just about custom essays. Apple is one of the major competitors of Samsung in the mobile industry, both of them have been competing with each other for so long. I love Apple products, their marketing team is awesome. Really awesome article about Apple and their marketing. Thanks for sharing. That y I am a proud apple fan. I love all my apple gadgets and I proudly show them to the non apple users. This is a very helpful Fat Loss Factor Review post; I was looking for this information. Just so you know I located your site when I was doing research for blogs of article and I like it, so please check out my site sometime and leave me a comment to let me know what you think. I must say, as a lot as I enjoyed reading what you had to say, I couldn’t help but lose interest after a while. All the contents you mentioned in Online Advertisement publish are too good and are often very useful. I helps keep it in head, thanks for sharing the data keep updating, anticipating for more posts. I will be truly experiencing examining ones post concerning Tinnitus and it’s well crafted articles. I do believe spent several persistence changing your blog. I will be truly experiencing examining ones well crafted articles. I do believe spent several persistence changing your blog. I want you to thank for your time of this wonderful read!!! I definitely enjoy every little bit of it and I have you bookmarked of your Acne No More Review to check out new stuff of your blog a must read blog! You’re so cool! I don’t think I’ve read anything like this before. Thanks for your personal marvelous posting about Ben 10 Ultimate Alien! I actually enjoyed reading it; you will be a great author. I will always bookmark your blog and will often come back in the future. Its better if you think about what others may have to say instead of just going for a gut reaction to the subject. I am really loving the theme/design of your bluehost coupon. Do you ever run into any browsercompatibility problems? A few of my blog readers have complained about my website not working correctly in Explorer but looks great in Chrome. Have you got any tips to assist repair this matter? Previous Institution New Body facts is magnificent. I understand as well as respect your current clear-cut factors. Much obliged concerning taking the time to examine this about Vision without Glasses Review, I feel unequivocally about it and affection adapting all the more on this subject. On the off chance that conceivable, as you increase skill, would you see any problems with overhauling your web journal with more data? Cool Its better if you think about what others may have to say instead of just going for a gut reaction to the subject. Keep sharing this type of articles. The best part is I get to feel conceited and cool with a ultra shabby blender machine. Until I need to concede I don’t have a Mac. Yet. Nice effective article. It really helps me to understand some marketing tips. Thanks for sharing. Really helpful resoource and i need it badly. I need one who can do it so beautifully as i did. If you had to offer a product whos hardware costs over 2x as much as the market leader, you’d have to come up with some scheme to attract customers. This is done by using flashy marketing gimmicks, slick styling, and duping the customer into feeling good about overpaying for your product compared to the alternative [ kind of like how rolex watches stay in business ]. Classic snob appeal. The entire series of “I’m a PC / I’m a Mac” commercials drip with this sort of smarmy smugness that builds up a small but rabidly loyal fanbase who drink the Kool-Aid to be part of the Exclusive Cool Kidz Club. Probably the same sort of people who purchase Tommy Hilfiger clothing - buying products that include a ‘status surcharge’. I have no beef with Apple Products per se, but they are overpriced and I find the superficial way they market their products and represent their customers [ and competition ] repugnent. Apple Fanboys who are gullible enough to swallow the sales pitch dutifully look down on any non mac user that ‘doesn’t get it’ with open disdain and contempt. They have a good marketing strategy and everyone must take some good lessons of it. They can really teach you many things about marketing, Taking into accounts that they launched themselves above their ‘enemies’ in this industry of gadgets with their only good looking items and only smart ideas, even if not better than the others. Thanks, What’s even more comfortable when you are entertaining after a day of hard work.